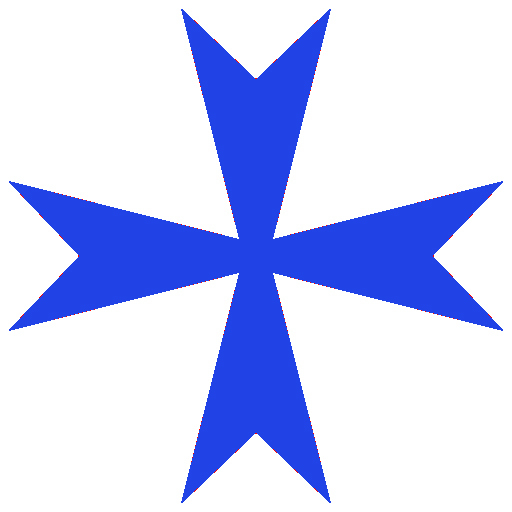 The Ordo Militaris Catholicus — Our Insignia – Ordo Militaris, Inc.
Official Heraldric Description: Argent, a Maltese cross azure. Symbolism: A Field of White, to represent that our Profession of Service is Immaculate. A Maltese Cross, to show that we walk in the footsteps of the Crusaders of old, our forefathers: four arrowheads, to show that we must be prompt and zealous in the fight on all sides; all pointing to the same, to signify that we must work together for the same objective; pointing to the center of the Cross, since the Sacred Heart is the source of all its power. Blue (azure), because we seek the glory of Heaven under the Mantel of the Most Blessed Virgin Mary, the Holy Theotokos. Blessed the men who merit to bear our Insignia. May theirs be honor in life and glory in the world to come! © 2016 – 2018, Ordo Militaris Inc.. All rights reserved. Certain incorporated images are public domain.